When I closed my shop front and moved my studio home people would often remark ‘I miss your windows’. Being in a street dominated by restaurants and open exclusively by appointment had given it an aura of otherness in a town like Hobart. 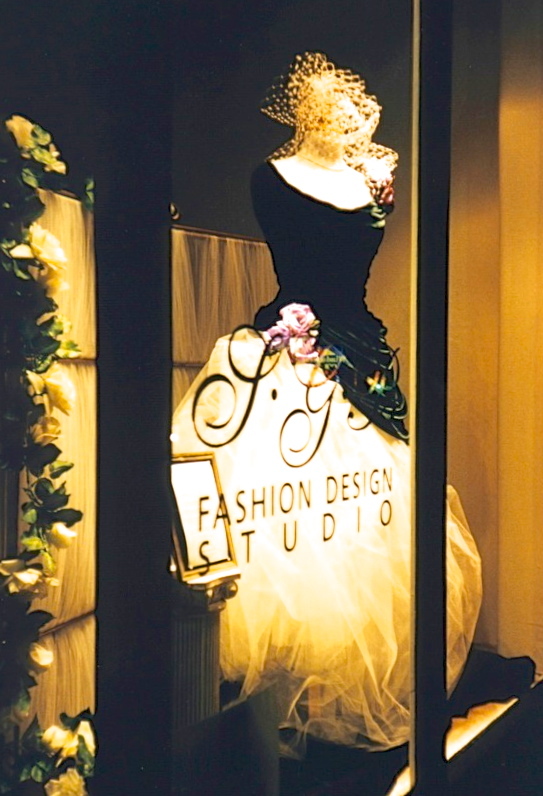 I enjoyed dressing the window in the same way I now enjoy making my Garden Fairy’s Wardrobe designs – a chance to play with ideas (or simply a chance to play) by draping fabric lengths on a dress stand. Over the years I was there I had some interesting conversations with people who regularly went past to see what was in the window and they stopped in to express their enjoyment even if they were not likely to become a client. One was a woman who said her mother had been visiting from interstate and on returning home asked her daughter to describe the latest ‘gown’ in the window when ever she wrote to her – how I’d love to read those letters. Another was a man who had a weekend ritual of strolling to get the newspaper and stopping to photograph my window. He enjoyed the challenge of taking an image through glass without reflection and the dress stand and fabrics reminded him of his mother who had been a seamstress. I thought I’d add some ‘window dressing’ pictures to the Petal & Pins mix so you can travel back in time and stroll past my window too. Love seeing the photos of your windows Sandra, they are just so beautiful! Thanks Meran – maybe I’ll do a ‘ Window Wednesday ‘ post each week. So beautiful! A reminder of many happy visits. “a Window Wednesday” is a great idea!